7th September seems an awfully long time ago. Apple announced the iPhone 7, removed the headphone port but also heralded a wireless future…October will see the release of Apple’s AirPods which will make you totally forget about wired headphones. Except October came and went with no AirPods released. Last week they announced availability online and also in store from December 19th. I’d had no big inclination to buy them but I was keen to get rid of the wires, EarPods had suited my ears up to now and I was keen to play with a new toy – what is there to lose? I’ve used them for four days now, in and around the house and also on a couple of longish walks so felt that was enough time to share some views. The AirPods aren’t just wireless earphones. The case they come in is also a charging and storage device. When you first unbox the AirPods and open and close the case it just feels right. There’s a nice weight to the case and the lid has a nice magnetic close – it’s great for fidgeters. When you first unbox the AirPods the case has some charge as do the AirPods but it looks like the amount of charge varies looking at posts on Twitter. 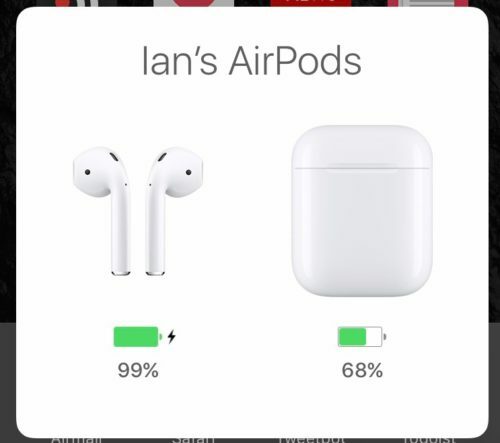 The AirPods battery life is around 5 hours and a fully charged case + AirPods will provide around 24 hours of battery life. Popping the AirPods in the case for 15 minutes will provide around three hours of charge so if you do run out of juice it doesn’t take long to get back up and listening. The case is charged via a lightning port on it’s base and before you throw out or store your AirPods box remember to take out the charging cable. One of the slams against the AirPods is that you’ll lose them – I just don’t get that. You’ll use the case to carry them around and unless you are a total klutz I just don’t see them being lost. If you do lose one of the AirPods a replacement will cost £69 from Apple. The case however is easily pocketable and really makes for a great carrying and charging solution. Switching on the AirPods is also really easy – just remove them from the case. To switch them off place them in the case…which also uses magnets to snap the AirPods back into place. Something I have found with the AirPods is that they are on the slippy side. They are small and I find it a little bit awkward getting them in and out of the case and into my ears. Potentially I can see this getting worse over time as they get a bit greasy from use so maybe the replacement from Apple will be a thing, not for lost AirPods but for broken ones as I’ve dropped mine a couple of times already. Opening the case near your iPhone pops up a pairing screen. Click on the Connect button and the AirPods are paired, renamed and the pairing information is sync’d across your devices via iCloud. The AirPods are at their heart just a set of bluetooth headphones but Apple have added a series of touches that make them the easiest bluetooth headphones to use. To see the current battery levels, open the case near the phone and up will pop the current charging level of the case and the AirPods. Pop an AirPod into your ear and you hear a small chime letting you know that the AirPods are on and connected. A duller chime will tell you the battery is almost dead. Another nice feature is removing one AirPod will cause the audio to pause. Replacing it will cause it to resume. This in many ways makes up for the lack of controls but not totally as you need to rely on Siri – more on that later. At work if someone approaches or I want to answer a call I need to pause and take out my headphones or just let them play and move back through the song or podcast. Now I just remove an AirPod, carry out a conversation, then place it back and the playback resumes. You can also just use one AirPod if you are making telephone calls. Each AirPod has a built in mic and you only need one for making and receiving calls. I’ve had no issues on a couple of calls so far with the AirPods although they weren’t outside so I’m not sure how they perform in windy conditions. So…Siri. I don’t get on that well with Siri and if there’s a major downside to the AirPods so far is their reliance on Siri to carry out commands. To invoke Siri you double tap on the AirPod and then ask Siri to change volume, skip track etc. It’s clumsy. It’s slow compared to a physical button. It’s weird, especially in public. It’s also not always accurate which a physical button usually is. It’s the biggest miss for me compared to wired headphones that have some form of clicker. 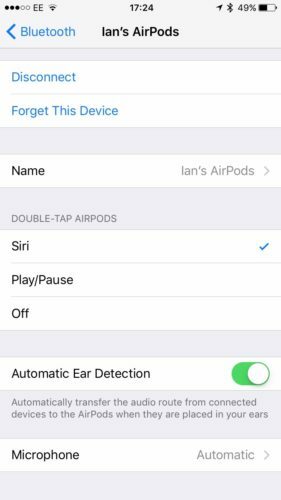 You can visit the bluetooth settings in your iPhone to change the double tap behaviour from Siri to play/pause or just switch it off. It’s a shame there isn’t some more options here. Why can’t I configure a single or triple click? Why can’t I configure the double click to skip tracks? Why can’t I configure each AirPod to act differently to a tap? Another thing thats weird is that if you have no internet connection…then no Siri…and no changing the volume via Siri – it just fails. Very un-Apple like and kills the experience. I’ll rely on using the phone or watch to make volume changes or skip tracks as it’s far easier and quicker. Headphones are no use if they don’t sound good and are comfortable to wear. Lets deal with the sound first. At work or out walking I listen to a mixture of podcasts and music. The sound quality of the AirPods to my ears is better than the EarPods but clearly isn’t the best out there. For me the quality is good enough. Audio is clear and plenty loud for my needs apart from on the underground. They aren’t noise cancelling so for airplanes there are better options. Flipping between AirPods and EarPods there is slightly more bass with the AirPods but I’ve some older in ear buds that sound much better. At work though I don’t want to be totally isolated from whats going on so the AirPods are good for me…I know others think differently or work in scenarios which mean they don’t want any distractions. If thats the case then the AirPods aren’t for you. Fit is more tricky. When I was running I had real difficulty getting in ears that would stay in my ear without having to fix them every minute. However the EarPods stuck in my ears no matter how sweaty, windy, wet it was. The AirPods are a slightly different shape to the EarPods but again they fit perfectly for me. They are comfortable, never feel like they are going to come out and I’ve worn then for hours and you forget they are even there. I did a shake test which shows they don’t come out for me. However I know others for whom the AirPods just don’t fit. They slip out easily or are really uncomfortable. So the fit is fine but there’s one last niggle – do AirPods look weird? I don’t think there’s much difference between AirPods and EarPods but they do look…odder. Longer and they stick out slightly. The design is where we are with batteries right now and how much can be packed into such a small volume. I’m fine with it and I’d rather walk around with AirPods than a large over the ear type device. AirPods aren’t cheap at £159 and that will put off a lot of buyers. For the price you can definitely get better sounding wireless headphones but for me the upgrade over the EarPods and the move to wireless are well worth the asking price especially as they work so well with other Apple products. If EarPods haven’t been an issue for you and their sound quality has been good enough then the AirPods are a great purchase. It’s Apple’s most delightful product in years.